Let the campervan adventure begin! 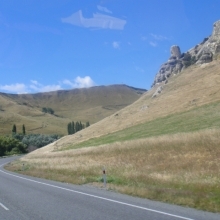 After catching up with friends and ringing in the New Year with loved ones in Christchurch, Jeff and I then set off on our 10-day campervan adventure. Campervan holidays are big in New Zealand but I don’t think we realized how big until we saw the number of campervans on the road. Wow! We are one of many, but unlike 99% of the others, our campervan is bright yellow…much like Jeff’s beloved truck back home, if you know it. So on that note, I should introduce you to our newest family member…Sunshine. Jeff and I set out in Sunshine on the afternoon of January 1st, the perfect way to start the New Year. We had a rough idea of what our 10-day holiday would look like, but only had one activity booked. 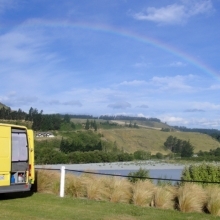 For we wanted the true campervan experience of being flexible and heading wherever the spirit moved us! Well, let’s just say that Mother Nature tested that flexibility from the start. 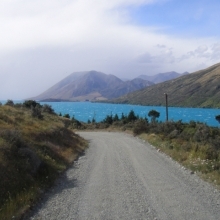 The first place we hoped to camp was too blustery (ie, gale force winds at Lake Coleridge), so after trying a couple places with no luck, we ended up camping in a gorgeous camping ground nearby on a high bank near the Rakaia Gorge. We enjoyed a beautiful dinner and drinks in Sunshine as we watched the sun set over the gorge. It was truly wonderful. And that’s when the wonder ended. The story almost gets laughable from here. Murphy’s Law at it’s finest. For not long after we left the gorge, we learned that the bank across the river from where we camped had flooded (if we’d left any later, we would have been stuck). 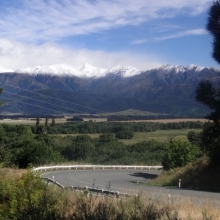 And when we stopped for a pie and a coffee, we learned that the route we had planned to take (thru Arthur’s Pass) was closed due to slips and that the bridge near where we hoped to camp would soon be closed too. Excellent! Ok, time to regroup. Our goal was to get to the West Coast. We knew that 3 passes led there, so if Arthur’s Pass was closed, we decided to go through the next closest one (Lewis Pass, about a 2.5 hour detour, but hey, we’re flexible right?). 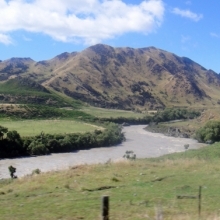 So we head in the direction of that pass deciding that we’ll make it “fun” and camp overnight in Hanmer Springs, a (way too touristy) thermal resort. 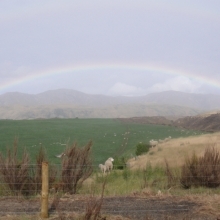 While at Hanmer, not only did the skies open up right after we parked but we also learned that the Lewis Pass had just closed AND that one full section of a bridge on the West Coast road had been damaged by the storms and was impassable. So, time to regroup again. And sadly, with this regrouping, we began to realize that the West Coast just wasn’t meant to be. This was quite disappointing, since the West Coast is special to Jeff and fascinating to me (it’s the rainforest region where I swear a dinosaur could walk out of the bush and that would seem normal). But, alas, it is what it is. Next time. So, feeling a bit like we were in a game show, we decided to try for Pass #3 (Lindis Pass), hoping this was the pass that would finally allow us to explore some part of NZ west of the east coast! 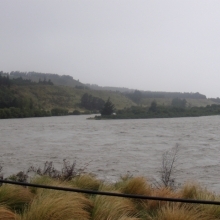 So we booked a campground for the next night in Lake Tekapo, the central lakes region, and planned to make our way southwest towards Lindis Pass, keeping an eye on the weather as we went. Finally (finally! 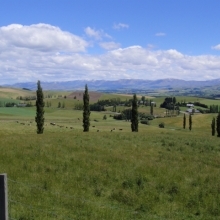 ), the rains subsided and our trip to Tekapo was sun-drenched and gorgeous. Almost as if the previous 2 days of torrential rain hadn’t happened, except for the remaining evidence of the now snow-capped mountains and the raging rivers that drained from them. The rain, wind, and rules prohibiting freedom camping kept us from camping at our desired site. The one good thing about sun and rain is rainbows...they abounded on our first day, as we searched for places to camp. A rainbow shone on Sunshine's first evening with us....note the level of the water here (this is a BEFORE picture). Most of my pictures from this day are of the raging rivers. 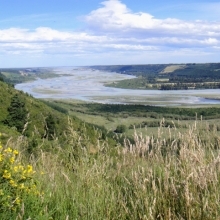 The usually braided rivers were replaced with powerful torrents. Impressive! Outside of Hanmer Springs after the rain subsided...we could see snow caps on mountains we couldn't even see the day before! An example of some of the scenery...the random rock outcroppings are pretty cool. 2 Responses to Let the campervan adventure begin!